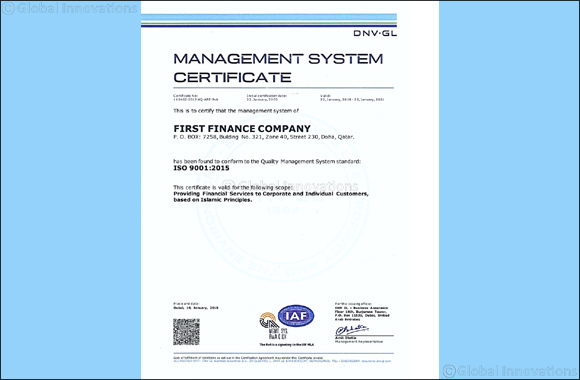 Doha – Qatar, May 03, 2018- First Finance Company (FFC), a subsidiary of Barwa Bank Group, has received the Quality Management System Standard Certification, known as ISO 9001:2015 from the international accredited registrar DNV GL in the field of providing financial services in accordance with the Islamic Shari’ah law. It is worth mentioning that First Finance Company was founded in 1999 with a capital of 640 million Qatari riyals and focuses on meeting the financial needs of both individuals & corporate customers through top-quality of Shari’ah compliant financial services. First Finance Company is regulated by the Qatar Central Bank and is among the leading finance companies operating in Qatar.